Welcome to day one of my Ornament Extravaganza! Today, I decided to go with a simple ornament. 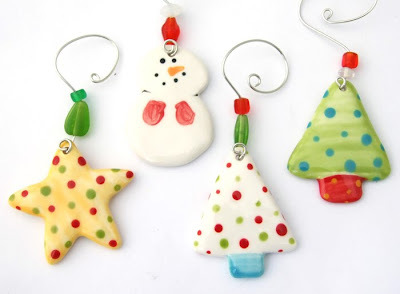 These are my new Holiday Pendants, they make a great ornaments as well as a great pendant. I used a silver craft wire to make a "swirly thing" at one end. I threaded this through the pendant and bent the wire so it was standing straight up. I added a few beads and made another loose swirl at the top and voila, the ornament was finished. I will be giving away one of my tree ornaments this week, leave a comment here in the post sometime before the end of Saturday the 14th and you could win. I will be giving an ornament away for everyday of the extravaganza so stop back by and leave a comment everyday. I will announce the winners on Monday here at the blog.